Lotteries have been around for centuries, and, sadly, so too, have lottery scams. These scams cost millions annually and cause pain and suffering to unsuspecting victims. That's the bad news. The good news, however, is that, generally speaking, these scams haven't really changed much over the years and are therefore easy to spot, provided you know what to look for. Which is precisely why we've put together this top ten list of the most common lottery-related scams and how to recognise and, therefore, avoid them. The advance fee scam is perhaps one of the most common lottery scams out there. In fact it's one of the most common online scams period. In essence it's not much different to the good ole Nigerian "419" scam, except instead of being request from deposed African monarchs or petro-rich benefactors (who have it on good authority that you're a trustworthy individual), the message informs you that you have won a lottery or sweepstake that you never even entered. How it works is that you are then asked to pay some manner of processing fee, or provide sensitive financial data, in order to claim your fictitious winnings. Sounds fairly silly when you put it that way, but as the WA police warned in a recent publication that these types of crime are actually quite subtle and appear reasonable, at least in the initial stages. Of course that's how all scams work; the old lobster in the pot analogy, which is why they can prove so costly. According to a recent ACCC report Australians lose $45 million annually to such scams. The cost of such scams globally is even harder to tally with similar operations operating worldwide from London to Kingston. …You don't remember entering it. They tell you you've won but it's not all that easy to make an email look official, especially if you have the time and resources to mimic the design and branding of the lottery perfectly. Often times it will be for a foreign lottery you're vaguely aware of, such as American lottery MegaMillions, the UK National Lottery or EuroMillions. Making the email, logos and so forth look the part is one thing, however. Writing a clear, grammatically-correct email is quite another. Which, as they're generally not native English speakers, is usually what gives these scammers away. I've won all sorts of lotteries over the years, unfortunately all of them fake. I've won the Texaco Lottery, the United Nations lottery as well as the Microsoft, Yahoo and Google lotteries. In this variation of the scam an email arrives to inform you that you have won a lottery sponsored by some well-known company. In a strange way these make more sense because they circumvent the doubts you might have about never entering. In this case your postcode, email address or social media profile has been "automatically entered" into the lottery and – hey presto! – you're a winner! No, you haven't won the lottery this time. But a recent high-profile winner who's made lots of headlines certainly has – and they'd very much like to give you the money because you're such a great person. As people get wiser to fake lottery wins lottery winner scams are becoming increasingly common. One high profile winner scam that's still doing the rounds is the Weir Trust scam. The Weir Trust was an organisation established by Colin and Chris Weir after their massive €180 million EuroMillions jackpot win. It was the UK's largest jackpot win by Sterling value, coming in at £161,653,000 or approximately $342 million AUD. The sum alone was enough to make headlines throughout Europe and beyond, but the trust they established with their newfound fortune ensured they continued to remain newsworthy years after their win, in particular last year, since the Weirs were also one of the chief contributors to the Yes campaign for Scottish independence. As a result Weir Trust advance fee scams were still being reported by the press this year. That's an old one, huh? When was the last time you believed anyone who said that? And yet there are plenty successful lottery scams working on that very premise. Lucky you, you've won big on a foreign lottery. Now, for but a small processing fee, you'll be sent out your winning check. Of course good luck trying to cash it, because it's useless. There are plenty of variations on this scam where they'll use the same message to dupe you and draw you in, but for other reasons. For example rather than asking for you to pay a fee, they might just ask you to enter your bank details, credit card number or other critical financial data which you should never give out over email under any circumstances. The same goes for account login details. Other dangers include asking you to click a link, which then sends you to a site that infects your computer. And then there are the more old skool types who ask you to call a special hotline to claim your prize – which is, in fact, a premium number with extortionately high rates. And, of course, by responding or replying to these emails in any way you end up being put on the "suckers list" and the floodgates open as more scammers try and take a bite out of you like a shoal of ravenous piranhas. Lottery tickets are worth money, so no wonder fraud and forgery are so rampant. A common scam worldwide is a non-digital confidence trick, a classic con, if you will, whereby the mark is approached by somebody purporting to have a winning lottery ticket, such as a scratch card. The mark is shown the ticket, which, at first glance, appears to be a genuine, winning ticket and is given a reason why the ticket cannot be cashed. For example the mark might be told that the "winner" is unable to collect due to legal difficulties, fear of deportation, etc., and so agrees to sell the ticket to the mark at a bargain price. If the mark hesitates another participant arrives, generally a well-dressed man with an air of affluence who agrees to buy the ticket at a higher value, provided he can have the ticket straight away. This then adds pressure on the mark, which, in many cases, argues his/her right to buy the ticket instead. Of course the ticket is just a forgery, and therefore worthless. Some lottery tickets, in particular scratchcards, aren't always the easiest to forge. But enterprising con artists have found lots of ways to alter or doctor them to suit the nature of their scam. Case in point this former manager of a gas station in California caught tampering with scratch cards. The method used is known as "pinning", a way of determining which tickets are winners and which aren't, so that he could only sell those to his customers. The big concern here is that it's not always easy to tell whether your ticket has, indeed, been tampered with – which is just one of the reasons why we always recommend you play with reputable online lottery companies instead. This one's so simple and audacious, and yet it could easily catch you unawares if you're not fully mindful. In one example, which we reported on our UK sister site, a father and son deli in New York attempted to con one of their customers out of a lottery win worth $1 million American dollars. Despite a screen readout " File claim: jackpot winner – please return original ticket to customer along with a claim receipt" appearing when the ticket was scanned, the father and son duo attempted to pass it off as a smaller win, withdrawing $1,000 from the till. Luckily the victim was wise to the con and brought the two men to justice. Last, not least, we come to one of the most persistent lottery scams out there – the sale of so-called foolproof systems for winning. Let's be clear here; the lottery is a game of chance, and the odds of winning are quite high. This is precisely what makes the game so attractive since it's those very high odds that allow for such enormous jackpots and prizes. Since the game is based 100% on randomly drawn numbers, each one completely independent of the other, there's no foolproof way to predict the outcome and therefore win. But, just to play devil's advocate for a moment, let's imagine you did discover such a method, a genuine, foolproof way to win the lottery. We're talking the mother of all golden geese right here, millions won each and every weekend. Would you really want to share that secret with anybody? Be street-wise when it comes to making your lottery purchases, beware of hustlers and always keep one eye on the person selling you your ticket. It's unfortunate that there are so many people out there trying to tarnish what is a fun and lucrative pastime for millions worldwide. We therefore trust that the information we have provided will help you remain more safe and secure when you bet on the lottery. 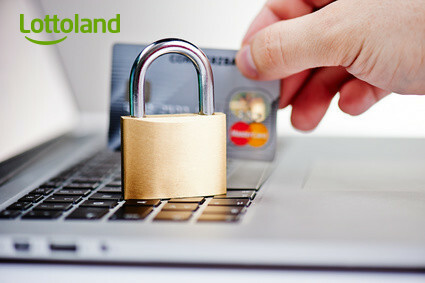 For extra safety and security, not to mention more features and options, we also highly recommend you bet online with reputable, fully-licensed operators such as Lottoland.